From the team that created Diner Dash, here's a new hit game! Which came first, the Chicken or the Egg? Find out in this eggsterically funny action puzzler! When Scarlett learns astronauts are starving because their corrupt boss made a crooked deal with a no-good contractor, she vows to prove herself worthy of taking over the account and feeding the hard-working space walkers three squares a day in Farm Frenzy 3: Russian Roulette! To succeed, she'll need to use new buildings, products and your Time Management skills as she grows crops, feeds animals, collects produce and manufactures goods. Not too excited about foodborne illness? Go au naturale and head straight for the farm. Jane and Joe are determined to revive Grandpa`s land by caring for chickens, pigs, cows, and other animals. Visit five separate farms and sell over 25 distinct products. Work through rough seasons like intense summer heat and a cold winter freeze. Can you turn Farmer Jane into a produce powerhouse in this Time Management hoedown? She's back! The crazy chicken from "Chicken's Revenge" is back on the warpath with vengeance. Defending her chicks in this "Magic Ball" style game, this mama bird won't put up with any fowl play when she's defending her brood. Non-stop action will put your reflexes to the test as you battle to save the little chicks! 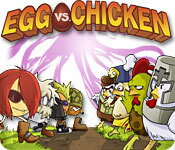 Prove your skills as you team up with our heroic hen to defeat a world of crazy guys and evil beasts!